Producing in Florida? Travel light, worry free and save. We're not a standard rental company, we do not rent a-la-cart. We'll drive a fully equipped van to your location with everything you can possibly need and assist you with the set-ups for the duration of your productions, all at a very affordable cost. We can also help in recommending reliable crews and assistance for your productions. Please call Nino or text 813-695-2025 for availability and most current rate. Based in the Florida's TampaBay region. We also have available a selection of generic Florida’s video clips should you need some for your production. In business since 1970, Serving Florida since 1997. 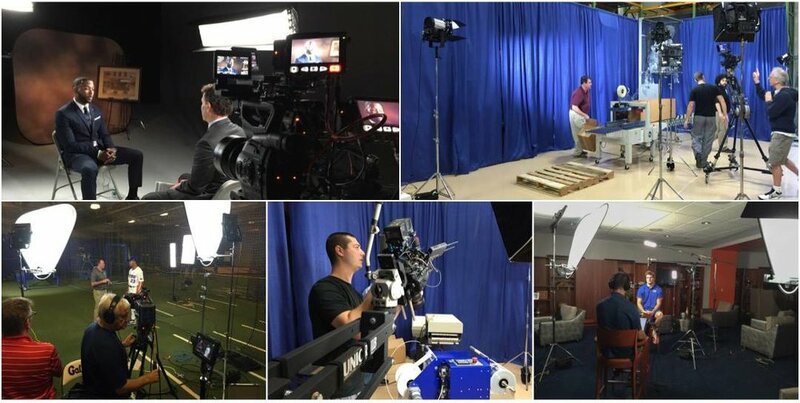 Our regular clients list includes ESPN, WWE, FOX Sport, NFL Network, NHL, MLB, CBS Sports, NBC Sports, NatGeo, Turner/CNN, Smithsonian Channel, BBC, German TV, Irish TV, RAI. See our extensive picture gallery for the various set-ups. The van is available with or without camera package. 7” - 9” -17” monitors. 7 misc. sizes Fresnel LED lights. 6 misc. sizes LED studio lights. 14 stands of various sizes from baby to large combos, booms. 8 C-stands w/gobo arms, etc. Dana Dolly w/9’ tracks and heavy duty Matthews stands. Complete hand and powered tool kit. 6’ - 12’ jib with power head. Canon Cine C500 w/4K external monitor-recorder. Sony A7RIII mirrorless with lenses and Tiltamax gimbal. GoPro 7 w/GoPro Karma gimbal and all accessories. DJI Osmo with all accessories..
Matthews Hard Reflector - 42x42" - Silver. 6’x6’ - 8’x8’ - 12’x12’ - 20’x20’ green screens with frames. I have been in the industry since 1970.